Texas high school teacher Jocelyn Shore had been looking forward to spending Thanksgiving at her Uncle Kel's ranch, but her visit takes an unexpected turn when she discovers Uncle Kel threatening his son-in-law Eddy with a shotgun. It seems that Kel, who is hosting the whole Shore clan, is none too happy about how Eddy has been treating his daughter Ruby June, and tensions are about to boil over. Thanks to Jocelyn's quick thinking, Eddy makes it out alive, and it looks like Ruby June is going to toss him out for good. Yet no one knows for sure because that is the last anyone saw of Ruby June. The family pins the disappearance on Eddy and files a missing-persons report. Still, it isn't until Jocelyn and her sometime-boyfriend, Austin homicide detective Colin Gallagher, find Eddy's body at the bottom of a caliche pit that the police really take notice. Unfortunately, all eyes---including Colin's---are on Jocelyn's family as the most likely suspects. While Colin assists the local police, Jocelyn and her cousin Kyla decide to investigate on their own. Their hunt turns up a shady ranch manager, a mysterious racehorse owner, and an overly persistent goat, but no sign of Ruby June . . . or a killer who is poised to strike again. 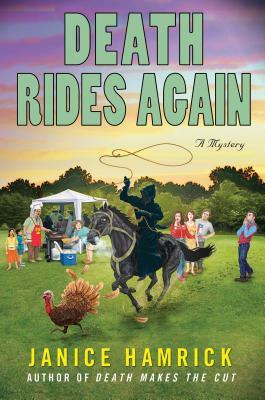 With a family reunion that is getting smaller by the minute and more romance and humor than can be fenced in on any ranch, Janice Hamrick's "Death Rides Again" is another outstanding addition to her award-winning mystery series. Janice Hamrick is the author of two previous titles in her award-winning Jocelyn Shore mystery series, most recently Death Makes the Cut. Her awards and nominations include a Minotaur Books/Mystery Writers of America First Crime Novel Prize, a nomination to be a Mary Higgins Clark Award finalist, and a nomination for the RT Reviews Reviewers' Choice Award. She lives in Austin, Texas.